Figure 3.2. Plot of the rate of burial of organic carbon divided by the rate of burial of pyrite sulfur (C/S) over Phanerozoic time. Low C/S ratios are characteristic of organic burial in euxinic (anoxic bottom water) basins, high values in terrestrial fresh water swamps, and intermediate values in normal marine (noneuxinic) sediments (Berner and Raiswell, 1983). The very low values during the early Paleozoic (550-400 Ma) suggest appreciable burial in global-scale anoxic bottom waters. The large maximum centered around 300 Ma represents a shift of major deposition from the marine to the terrestrial environment due to the rise of vascular land plants. Deposition on land results in high C/S because of the much lower sulfur content of fresh water compared to seawater. 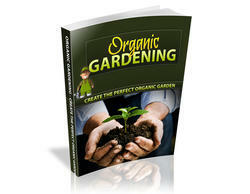 ductivity, with a consequent higher flux of organics to the bottom, than to better preservation in anoxic bottom waters. However, this idea is opposed by many authors. For example, Canfield (1994) has shown that the fraction of sedimenting organic matter buried and preserved is usually higher in anoxic as compared to oxic bottom waters. Hedges et al. (1999) have further shown that organic matter preservation is related inversely to the time of exposure of the organics to dissolved O2 in the marine environment. This links the two hypotheses of sedimentation rate and anoxic preservation into a combined explanation for organic matter burial. The range of S13C values for terrestrial plants, soil organic matter, and marine plankton is about -20 to -30%o (this excludes C-4 land plants that evolved near the end of the Phanerozoic). Values of S13C for dissolved inorganic carbon in the oceans over time are approximated by the S13C of calcareous fossils and limestones (e.g., Veizer et al., 1999). 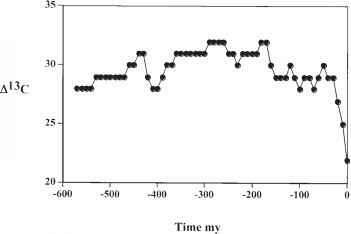 A plot for carbonate fossils is shown in figure 3.3. Assuming isotopic exchange equilibrium between the oceans and the atmosphere, the value of S13C for atmospheric CO2 should be about 7% lower than the oceanic DIC value. Thus, any change in the S13C value of the oceans should be mirrored by a similar change in that for atmospheric CO2. The data of figure 3.3 show a broad maximum of S13C centered around the Permian-Carboniferous boundary at 290 Ma. This maximum is most readily interpreted as the result of enhanced removal of light carbon from seawater and the atmosphere due to the burial at that time of greater amounts of isotopically light organic matter (changes in the burial of limestone have a much lesser effect on oceanic S13C). These results are in agreement with the results of measurements of the organic carbon contents of sediments of different ages mentioned above. In other words, there was more organic carbon burial in Permo-Carboniferous sediments. Much of the additional Permo-Carboniferous organic carbon burial was due to the rise of large vascular land plants (see next section). The fractionation of carbon isotopes A13C (equation 3.1) during photosynthesis has likely changed over Phanerozoic time. This is suggested by the compilation of S13C data for Phanerozoic sedimentary carbonates and organic matter by Hayes et al. (1999; see figure 3.4). Hayes et al. ascribes the drop in A13C during the late Cenozoic mainly to a drop in atmospheric CO2. 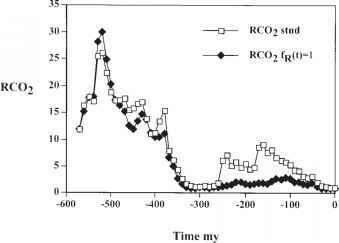 Marine photosynthesis is affected by changes in dissolved CO2 (Arthur et al., 1985: Jasper and Hayes, 1990; Freeman and Hayes, 1992) and terrestrial photosynthesis by changes in O2 (Beerling et al., 2002), and these dependencies can be used to deduce past levels of these gases in the atmosphere (see chapters 5 and 6). Figure 3.3. 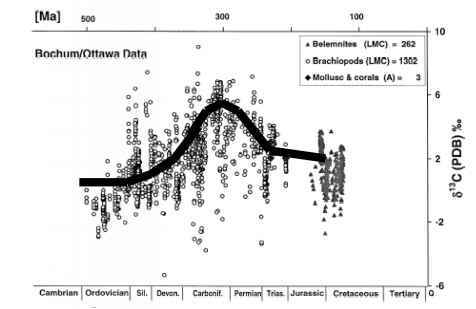 Plot of s13C versus time for the Ordovician to the Cretaceous Periods. The data are fitted with a "mean" value curve that is biased somewhat toward higher s13C values because of the distinct possibility that lower values are too low because of diagenetic alteration of the original marine isotopic signal. 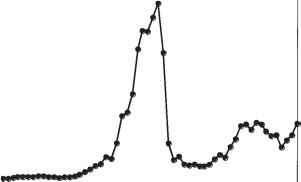 This fitted curve is used in GEOCARB modeling. (From Berner, 2001, after Veizer et al., 1999.) © 2001 with permission from Elsevier.